I wanted to make for the Deseret News Home show a very out of the ordinary wreath. I made this "wreath' with a French touch and under $50. You don't have to be very crafty or very talented to make this. Just take your time and have fun. -Chalkboard framed - Mine was from Hobby Lobby 50% off. 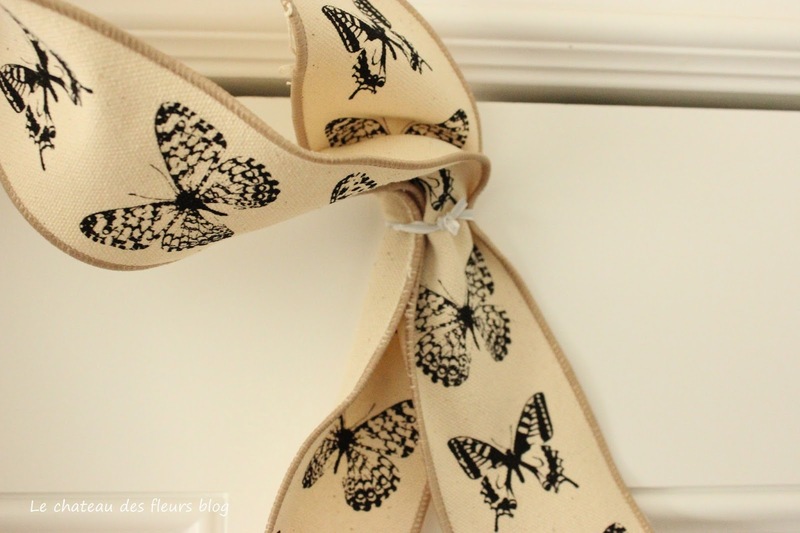 - 15 feet Butterfly burlap ribbon - Hobby Lobby. 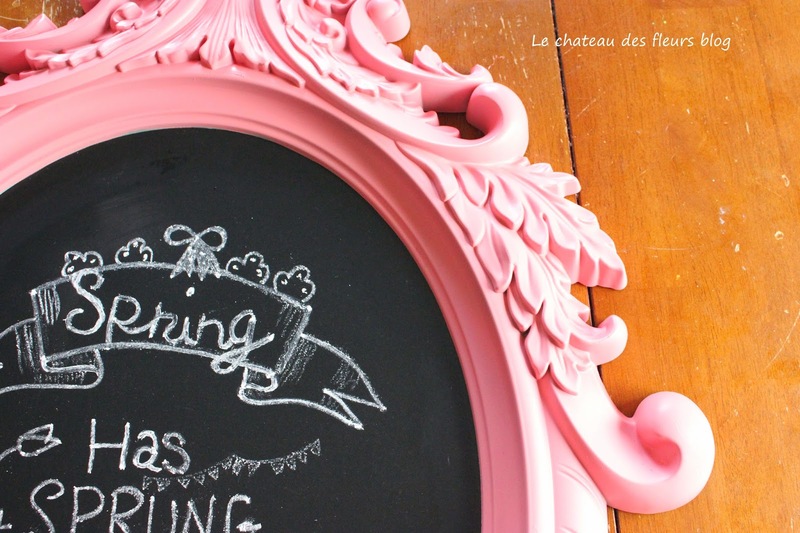 Prep your chalkboard by covering the whole board with chalk . Erase the chalk with Damp cloth. Sharpen the chalk with the big side of the pencil sharpener. wet your chalk and Copy the design of your choice free hand to your board. The chalk disappears to appear dense when dry. 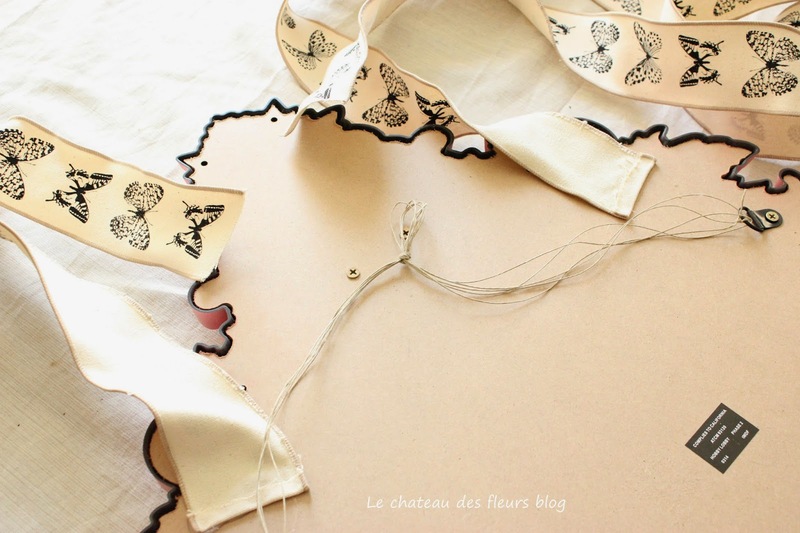 Add embellishments like a banner or flowers to fill spots you think needs it. Use dry cloth and cue tips to clean errors. I have some design choices on my blog. When dry, seal it with hairspray. Do light coats. The chalk disappears when the hairspray is wet and reappears when dry. Separate the chalk from the frame or mask the middle with painter's tape and news paper and Spray the frame with Coral paint. When dry place the chalkboard back. Tie the string between the 2 hanging hooks in the back of the frame, making sure the hanging top is where the wreath and the wreath hanger should be. Cut your ribbon in 2 same lengths. Hot glue the ribbons on each sides on the back of the frame. Hang your wreath on the string to the wreath hanger to the door and then attach both ribbons on the top of wreath hanger with bag ties. Make a bow by making 2 loops with each ribbons and tying them together. Cut the end of ribbons where you want then in a V shape. Hot glue top of ribbon to the wreath hanger or anything showing or you want to stay put. A little view of the Coral paint, Aqua Net hairspray. I use a mini glue gun. The original frame was blue. Wet your chalk to have a more dense writing. Sharpen your chalk. Write free hand your designs. Some ideas at the end of this posts. 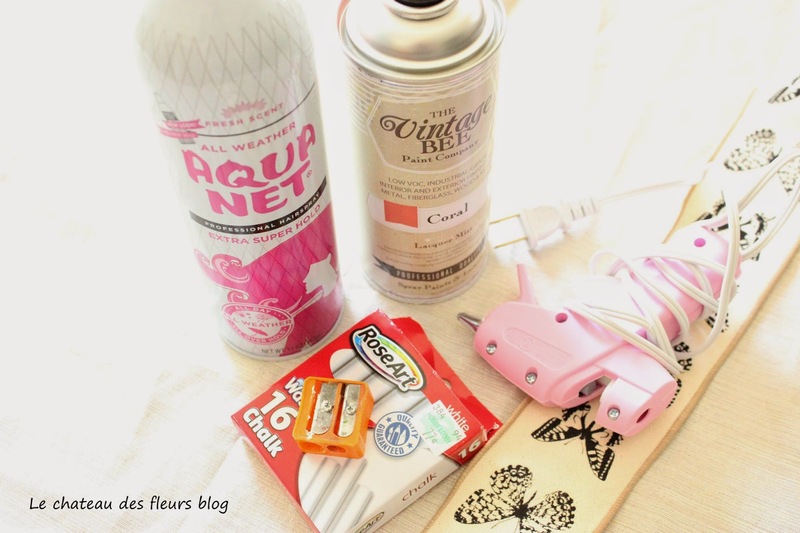 Seal your chalk art with Hair spray. Spray paint your frame with the Coral paint. I masked the middle part with news paper and painter's tape but you can also take the frame apart. Tie up your string in the back where you want to hang your wreath hanger. 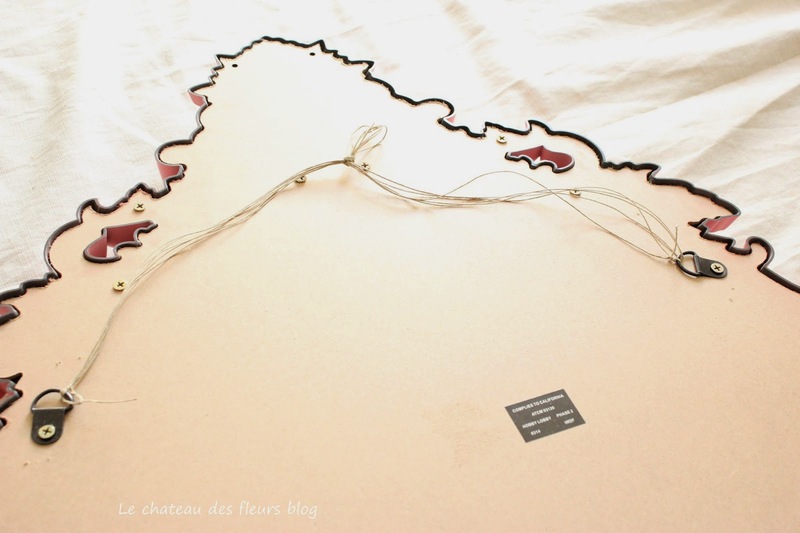 Cut your ribbon in two and hot glue each end on each side of the frame. 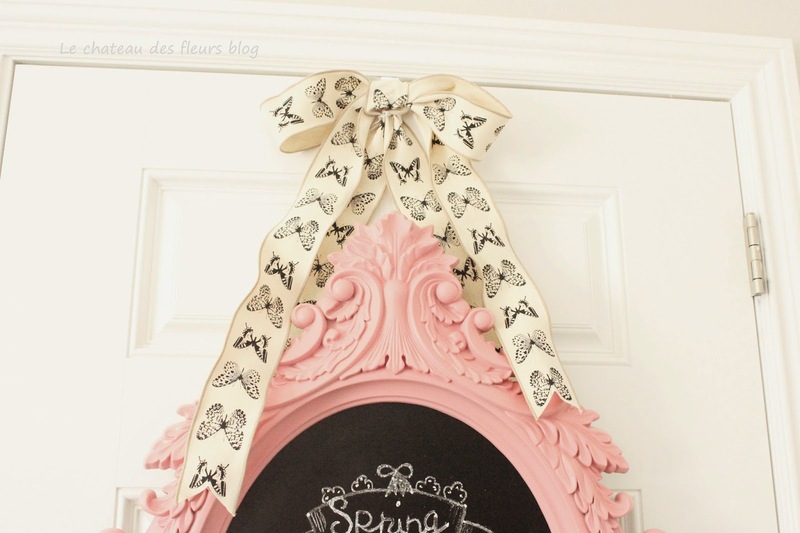 Hang your frame on the wreath hanger and attach both ends of the ribbon on the top of the hanger with tie. Make a simple bow. Hot glue the parts that you want hidden or you want to stay put. 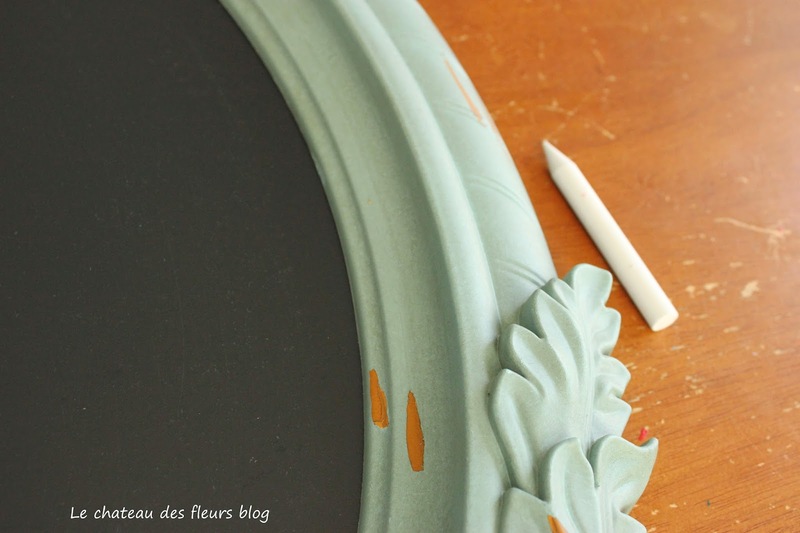 Very French, crafty, artsy chalkboard frame for your front door or interior. You can see it here on my black front door. Match your flowers in your pots to the Coral frame and you have a stunning, not like everyone front door. Chalkboard spring is here renew and grow. 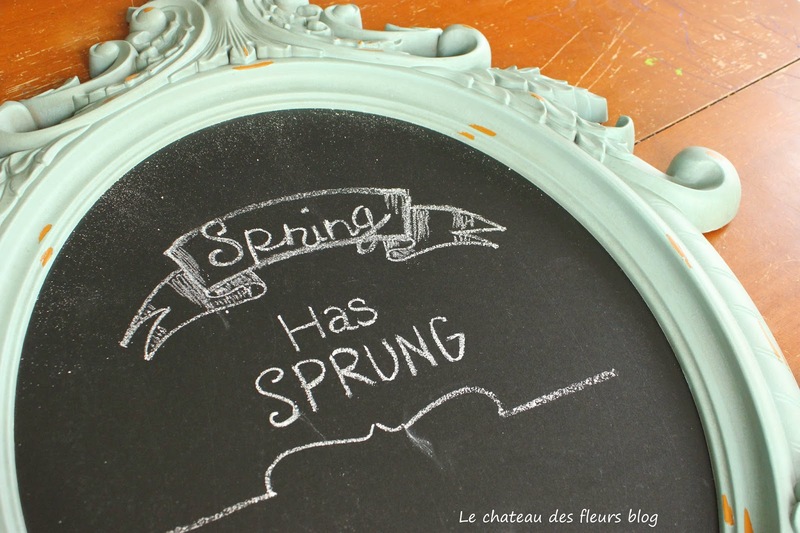 Chalkboard inspiration Spring has sprung breath it all in. Print the spring printables here. Doesn't it make you exited for Spring!? Disclosure: I was given a $50 Visa card to make this Spring wreath. It was such a pleasure to meet you today Isabelle. 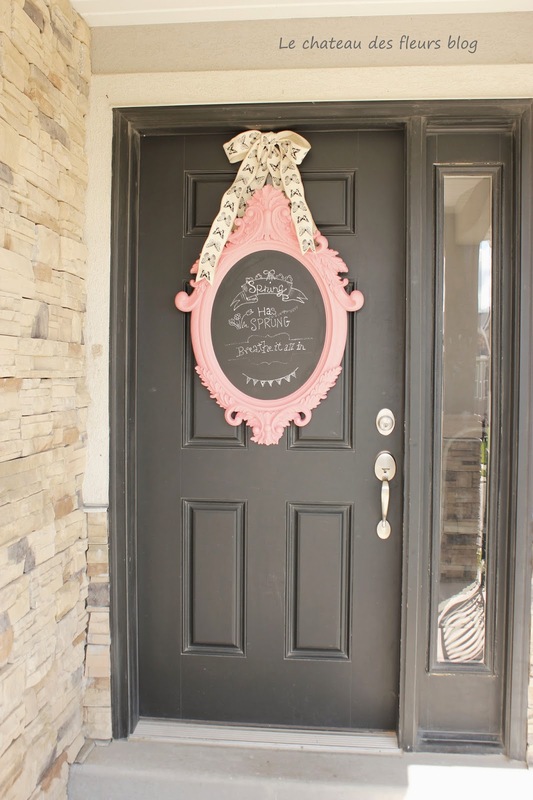 I adore the door décor for the home show! Hope to meet you again soon! Wowwww - it looks fantastic! !